Height 72cm, Width 76cm, Depth 17cm, weight about 100 Kg. Description: Part of the Ramayana Hindu legend, the king of the demons, Ravana spied Rama's beautiful wife Sita in the forest. He fell in love with her instantly. Ravana arranged for his servant Maricha to disguise himself as a golden deer and tempt Rama and Lakshman away from Sita. Lakshman drew a circle in the dust around Sita to protect her and told her not to step out of the circle. Ravana cleverly disguised himself as an old beggar man, and begged Sita for food and drink. Sita took pity on him and stepped out of the circle. The beggar man turned back into Ravana, catching Sita in his arms and pulling her into his magic flying chariot. The scene in this pediment shows the king of demons, Ravana is carrying the Sita on his left shoulder and his right hand is holding a spear. 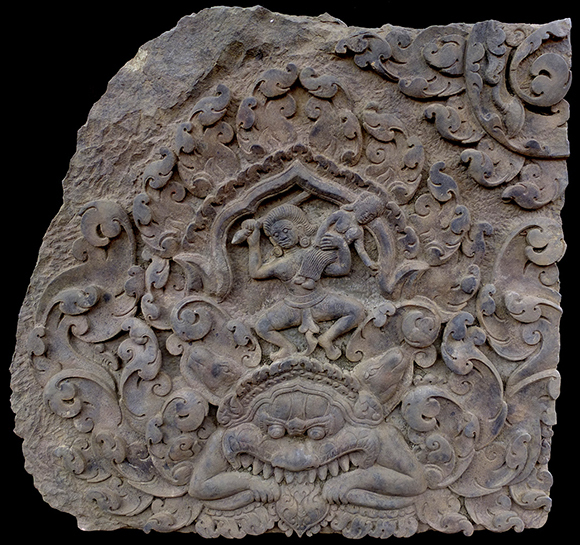 Under his feet appears 2 horses in this Khmer pediment.